Lucid dreams are when you know you're dreaming and you can consciously control events as they unfold: it's like being the director and star of your own Hollywood movie. It's estimated that about 20 per cent of people get to enjoy them fairly regularly (at least once a month). For the rest of us, a new study in the journal Dreaming suggests a really simple way to increase your odds of having lucid dreams – just start making more frequent use of the snooze function on your alarm clock. Bethan Smith and Mark Blagrove at Swansea University surveyed 84 people who frequent various Facebook groups and online forums devoted to lucid dreaming. There were 44 women, 39 men, and their ages ranged from 18 to 75. Based on the following definition of lucid dreaming as "occurring when an individual becomes aware that they are dreaming, and, while remaining asleep, can control some of the events or content of the dream," 23 participants said they'd never had a lucid dream. The remainder gave an indication of how often they had lucid dreams on a 7-point-scale from 1 (less then once a year) to 7 (4-7 nights per week). To give you an idea of the spread of answers, 12 participants said they had less than one lucid dream per year, while 5 participants said they had between 4 and 7 per week. One of the main findings to come out of the survey was a correlation between frequency of lucid dreaming and the number of times participants said they usually hit the snooze button on their alarm clock each morning. This correlation held even after controlling for the influence of other measures, such as the participants' tendency to recall their dreams and their number of awakenings per night. Putting this finding slightly differently, people who reported using an alarm clock snooze function at all reported having significantly more lucid dreams than people who said they never used a snooze function (snooze-function users averaged 3.04 on the 7-point frequency of lucid dreaming scale compared with 2.76 among the non-snoozers). We can't read too much into these results – after all, perhaps for some reason, people who are more prone to lucid dreaming just happen to like using the snooze function on their clocks. 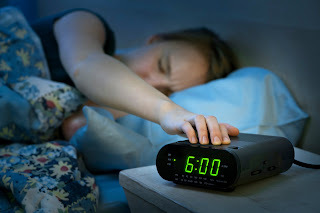 To check that alarm clock snooze functions really cause more lucid dreams, we need an experiment that randomly allocates some people to start using the snooze function and then we could see if they start having more lucid dreams compared with a control group. While caution is in order for now, the researchers explain that it does make theoretical sense that using the snooze function should lead to more lucid dreams. When people's sleep is interrupted, such as by the snooze alarm, it's more likely that they'll dip straight back into a light REM sleep, which is when lucid dreams mostly occur. Indeed, if you use your alarm clock to help you doze and wake intermittently, this is very similar to an established method for inducing lucid dreams known as the "Wake-Back-To-Bed" technique, which involves scheduling an alarm to go off an hour before your usual waking time and then deliberately focusing on remaining lucid while falling back to sleep.